We love to sit around the supper table and talk. It's a tradition I remember so well in my family. My mom once said that she felt like her own childhood experiences of sitting around the table talking played a big role in the development of her and her siblings. I feel the same way. One of my dearest childhood memories is sitting around our tiny round clawfoot table, eating stir fry and drinking hot tea to lamplight, with my siblings and I talking up a storm while mom and dad sat with quiet smiles and listened. Good stuff! Mom and Dad - great listeners! 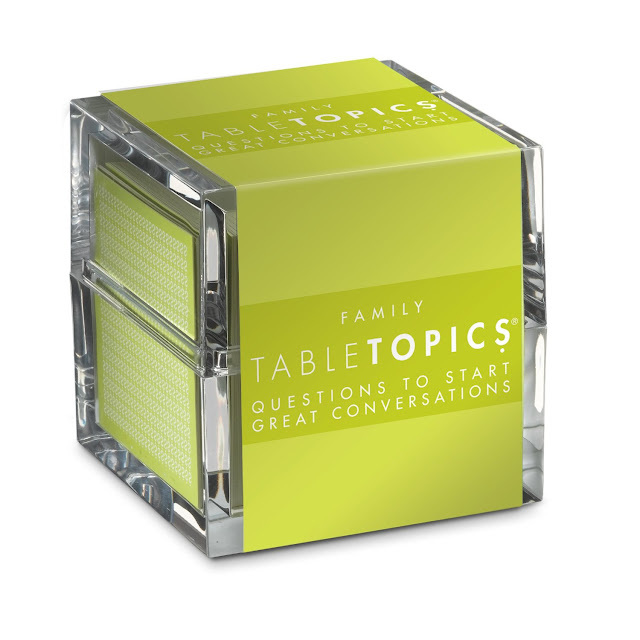 So when David was browsing a board game store in downtown Chicago and found the "Table Topics" game, we knew this was a "game" that fit our family and we might just had to have it someday. Sometime later, before a vacation with a lot of driving, I bought it for David and our family. We love it. We got the family version, but there are lots of versions: Couples, Road Trip, Family Gathering, Original... Some of the questions are light and fun, others are deeper and more serious. But our kids love it and beg to pull down the box and start asking questions. "If you could volunteer your time to help one charity, which one would you choose?" "When you receive two invitations at the same time how do you decide which one to accept?" "What's the first thing you would do if you were president?" "In what ways are you generous?" "When was it most difficult to persevere when you wanted to quit." Corin's responses are hilarious. He's three. Yesterday one question was...."What is your favorite family tradition?" He answered, without hesitation..."Playing trains in bed." We cracked up. We play trains in bed so often as a family. We love it when it's his turn to answer. He answers quickly and confidently. And his answers are just bonkers. We don't always pull down the Table Topics box and do a few questions, but like I said - the kids love it and beg for it. Great dinner time ideas. Our problem tends to be teaching the children to control their conversation (talking over each other, loud, etc.) as they are all BIG talkers! I totally agree...family dinners make all the difference in a child's life. Never heard of this - I'll have to make sure we take a look at it. We play the UnGame (Christian version) a lot which helps facilitate talking about spiritual topics without being "weird". Certainly this would help break out of the "what did you do today" routine :o) Thanks for the tip! キャロウェイ アイアン http://www.pandaoplace.com/ テーラーメイド アイアン,マイケルコース バッグ 人気 http://www.yourbreasthealth.com/ マイケルコース アウトレット, mary quantマリークヮント http://www.karaokekingdom.com/ マリークワント ポーチ 新作, ナイキ ランニングシューズ http://www.monkeybusinessbakery.com/ ナイキ エアマックス 90,アディダス スニーカー http://www.ddlcrowd.com/ アディダス スニーカー,ゴルフドライバー http://www.portcitypasta.com/ ゴルフ アイアン 人気,トリーバーチ バッグ http://www.chocolatethunda.com/ トリーバーチ 財布 2014,アディダス サッカーユニフォーム 2014 http://www.ephratamidgetfootball.com/ アディダス サッカー 日本代表,サマンサタバサ バッグ 新作 2014 http://www.cindyrestaurant.com/ サマンサタバサ バッグ,Chloe's moose is definitely Soup, a mild Dull Nederlander Warmblood stallion who also stocks Chloe's spark regarding assurance to the point that he seems he is the most accomplished horse throughout Horseland. Chili regularly thinks upstaged and hardest simply by his showy riders. テーラーメイド ドライバー [url=http://www.pandaoplace.com/] ナイキゴルフ[/url] キャロウェイドライバー, He or she and also Aztec will always be entering into a quarrel, but they also seem to be friends. マイケルコース 財布 2014 [url=http://www.yourbreasthealth.com/]マイケルコース バッグ 人気[/url] マイケルコース 時計 メンズ,The icon is actually a violescent precious stone. Zoey is usually 12 years old, younger in the Stilton twin babies. マリークワント ポーチ 新作 [url=http://www.karaokekingdom.com/]マリークワント ポーチ 新作[/url] マリークワント ポーチ,As opposed to Chloe, the woman older related, Zoey ingests a sly technique ready competition. ナイキ スニーカー [url=http://www.monkeybusinessbakery.com/]ナイキ ゴルフ[/url] ナイキ エアマックス 90,Zoey can also be in to manner along with makeup foundation. Jane is proficient at riding in Cross-country, アディダス スニーカー レディース [url=http://www.ddlcrowd.com/]アディダス スニーカー レディース[/url] アディダス スニーカー ジュニア,and they are outspoken throughout protection regarding her beliefs. When Zoey is cut-throat ready sibling,ゴルフキャディバッグレディース [url=http://www.portcitypasta.com/]ゴルフ フェアウェイウッド 人気[/url] ゴルフ パター 人気, the girl with quite support involving Chloe during need. Zoey stock shares the girl sister's destroy on Cromwell. トリーバーチ 財布 2014 [url=http://www.chocolatethunda.com/]トリーバーチ アウトレット[/url] トリーバーチ バッグ 人気,Even though Zoey might be impolite and cut-throat, she can be sensitive along with nice. Zoey possesses red-colored locks and also environment friendly view. アディダス ジュニアスパイク [url=http://www.ephratamidgetfootball.com/]アディダス サッカーユニフォーム 2014[/url] アディダス トレーニングシューズ,The woman favored colour will be light blue. Zoey's horses is White pepper, a darker Off white Dutch Warmblood mare that is certainly quicktempered. The lady really likes the woman biker, サマンサタバサ アウトレット [url=http://www.cindyrestaurant.com/]サマンサタバサ アウトレット[/url] サマンサタバサ バッグ 新作 2014,and it is best friends along with Soup, but isn't very about this kind of good terminology using the additional farm pets. She's self-assured and also spirited along with loves to compete.